← What are we bringing? I’ve had this Bible for over 7 years. It has been with me during difficult time and moments to celebrate. 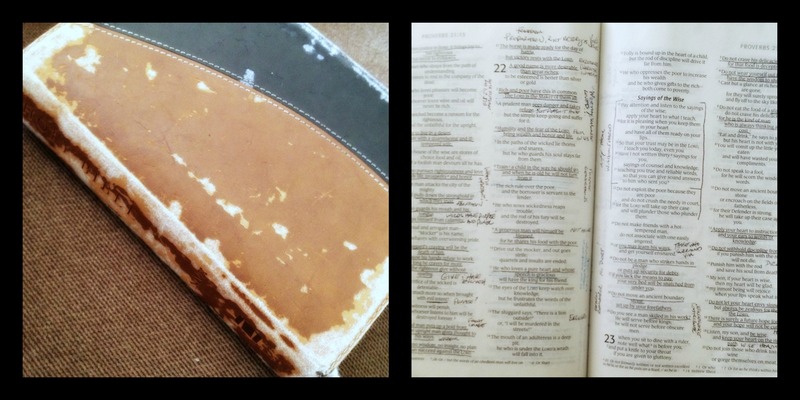 The cover is broken, yet it is filled with lessons I’ve learned from various verses. I know it’s time for a new Bible, but it’s not easy. It holds a lot of lessons that I’ve learned. I need to continue studying the Word. I’ve learned a lot of Truth as I have studied His Word, and I’d be a fool to think I know enough or I know it all. I can’t run ahead of God with only with what I know now, but I can move forward with God continually learning what He is teaching me. I am thankful for this Bible, for these lessons, and I remain open to all there is to learn. As I close this Bible, I am excited for a new Bible. It will be another Bible that has more memories and more lessons that will be a part of my heart. Now, I think it’s time to get a Spanish Bible! I love seeing the notes in your Bible! I love to go back and read mine! What a great post and a special Bible! Mine has torn pages and notes in the margins, with references to commentaries. Very thin pages so I put in tabs so that when I read it in worship or bible study I don’t tear the pages more. But, now the tabs are tearing off too. That’s why I bought the slim NIV version you sold. Love you.